Over the past decade, vocalist Kate McGarry has issued 5 CDs on Palmetto Records that straddle the lines between jazz, pop and folk. She has done so with a clear voice, avoiding vocal tricks and cliches, making sure the listener hears the lyrics and melody. On her most recent CD, "Girl Talk", she paid tribute to her influences ("role models", she calls singers such as Betty Carter, Sheila Jordan and others) without imitating any of them. The immediacy of the recording (mostly recorded in concert at Soundpure Studios in Durham, North Carolina) makes the listener as if he is seated at the front table. There is an intimacy to the songs, a gentleness and wistfulness that transcends labels. The CD takes its name from Ms. McGarry's middle name and her belief that her husband is, in her words like "the peaceful bull from that old children's book who only wants to sit under a tree and smell the flowers while the other bulls are fighting". "Genevieve and Ferdinand", Kate McGarry and Keith Ganz, whatever names they chose to be called, make music that is warm like a mug of mint tea on a winter day and cool like a spring breeze. For more information, go to sunnysidezone.com/album/genevieve-ferdinand. Such a joy to discover a vocalist who makes a recording that knocks you back in your chair. Zara McFarlane, born to a Jamaican family living in a suburb of London, England. She has studied Broadway musicals, sung in a ska orchestra, made "house music", worked with jazz orchestras and toured with British artists such as Soweto Kinch and Denys Baptiste. That written, her sophomore release, "If You Knew Her" (Brownwood Records), will surprise you with its maturity and risk-taking. 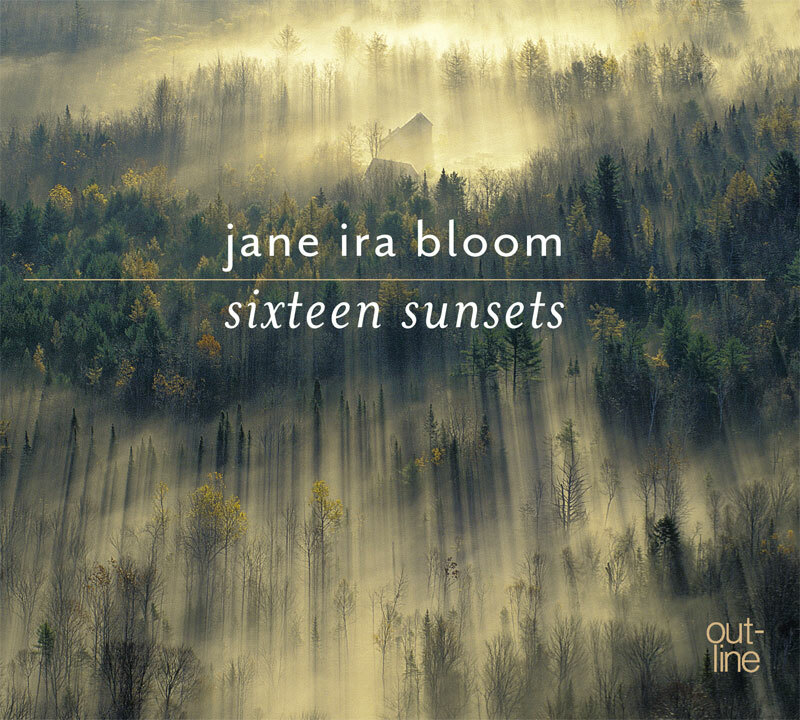 She writes that her debut CD "Until Tomorrow" used the same lineup all the way through "to create a cohesive sound." For the new recording, the focus is on the compositions and uses different musicians on almost every track. Manu Delago's hang drum is the first sound one hears on "Open Heart" (the hang - pronounced "hung" - sounds, at times, like a high-pitched steel drum) and leads the listener into a soulful vocal. Ms. McFarlane's voice is rich and clear; she overdubs harmonies that work with Gavin Barras' bowed acoustic bass lines to fill out the sound. Her rendition of "Police and Thieves", the classic reggae tune composed and recorded by Junior Murvin and Lee "Scratch" Perry, is quite dramatic. Built off the solid acoustic bass lines of Max Luthert (a member of the British trio Partikel), the track features a forthright vocal (not unlike Abbey Lincoln on "We Insist! Freedom Now Suite") and a strong tenor sax solo from Binker Golding, a member of Ms. McFarlane's Quintet. The vocalist also covers "Plain Gold Ring", a song Nina Simone recorded on her splendid debut Lp "Little Girl Blue." With just Luthert's simple bass figures, hand percussion (supplied by the vocalist) and vocal overdubs, the song is emotionally rich that suggests at Ms. Simone's husky delivery but stands out as a creative remix. Trumpeter/vocalist Leron Thomas joins Ms. McFarlane on the jazzy remake of Jamaican singer Nora Dean's "Angie La La" which also features the strong bass work of Gavin Barras and swinging drum work of Luke Flowers (of The Cinematic Orchestra) - this take suggests the work of the late Leon Thomas (no relation to the trumpeter) in the open chords, the trance-like rhythms and the often ethereal vocals. 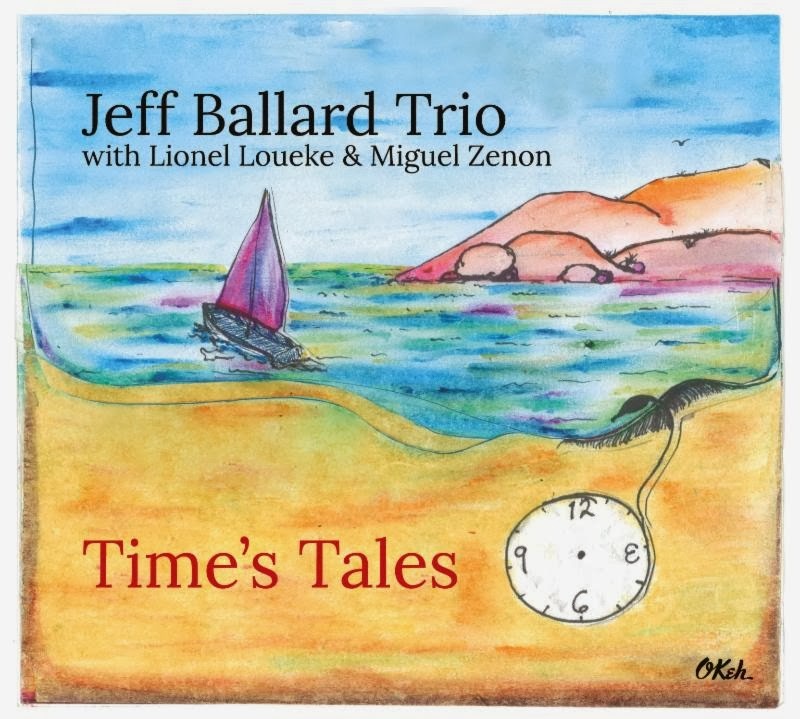 The original composition "The Games We Played" suggest an African connection in the lyrics, with just the sweet vocal and the gentle piano of Peter Edwards (who appeared on her debut CD and whose Trio features bassist Luthert). That leads into "Woman In The Olive Groove", a harder-edged piece with powerful chords from Edwards and a fiery tenor solo from Golding. Edwards also appears on the final track, "Love", accompanying the vocalist with unembellished chords (though he has several short solos featuring rippling phrases) - Ms. McFarlane's vocal suggests a sweetness and maturity, a generosity of spirit and lack of ego that gives the piece (and, for that fact, the entire album) its honesty. Honesty, creativity, spirit, all good (if somewhat inadequate) words to describe "If You Knew Her." You should get to know Zara McFarlane as she is a young vocalist/composer who does not cover her voice with extraneous sounds (although some of the remixes on the Brownwood web site get pretty noisy) and her songs cut through the crap of everyday life with a firm but compassionate heart. For more information, go to www.zaramcfarlane.com. Seemingly without much fanfare, The Side Door Jazz Club in Old Lyme, CT, has become quite the venue to see and hear music. Located in the Old Lyme Inn, right off of Interstate Route 95, the nightspot is 15 miles from the nearest city (New London) but strategically placed close to both Boston and New York City (as well as Providence, Rhode Island, and New Haven.) Since Ken Pickering opened the doors back in the late Spring of 2013, the club has brought world-class musicians to play for joyous crowds. This coming week is no exception. On Friday January 24, the venue welcomes saxophonist JD Allen and his Quartet, featuring pianist Orrin Evans. Allen (pictured above), born in Detroit, has been on the scene for nearly 2 decades, has worked with a slew of jazz greats, from vocalist Betty Carter to trumpeters Dave Douglas and Jeremy Pelt to composer Lawrence "Butch" Morris to pianist Evans' various groups. 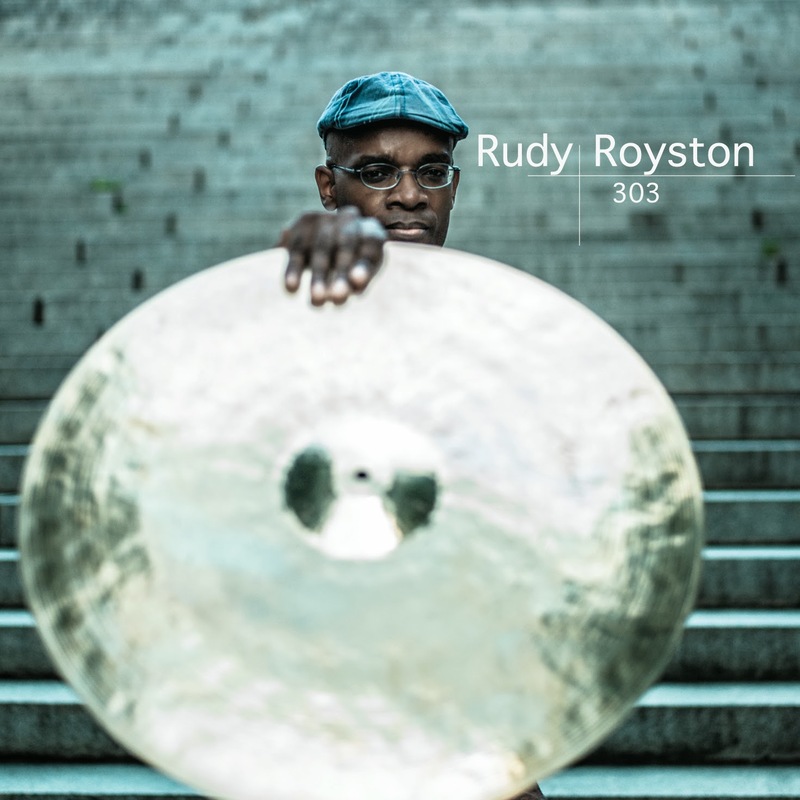 His series of Trio CDs for Sunnyside Records and Savant, recorded with bassist Gregg August and drummer Rudy Royston (issued between 2008 - 2012), displayed a composer, arranger and improviser who understood group dynamics and how interactions moved the music forward. His 2013 Savant CD, "Grace", introduced his Quartet with pianist Eldar Djangirov and the Hartford, CT, rhythm section Dezron Douglas (bass) and Jonathan Barber (drums). Doors open at 7:30 p.m. and the first notes commence at 8:30 p.m.
Saturday (1/25), The Side Door opens for the Andrew Atkinson Quartet. Drummer Atkinson, born in Jamaica and raised in Miami, FL, brings many influences to his music, a fine and often fiery mix that leans towards mainstream jazz. On Tuesday (1/28), the Matt Wilson Quartet + John Medeski (all pictured left) celebrate the release of "Gathering Call", the drummer's latest venture for Palmetto Records (reviewed below). This is a rare weeknight date for the Club but who can resist bringing Mr. Wilson and his compatriots in to play any night of the week. For reservations to any and all gigs at The Side Door (including the Fred Hersch Trio on 2/7 + 8, vocalist Patricia Barber on 2/25 and Wayne Escoffery on 3/01), call 860-434-0886. To check out the impressive lineup, go to thesidedoorjazz.com. No surprise that drummer/composer Matt Wilson gives the title "Gathering Call" to his latest CD to feature his Quartet of Jeff Lederer (soprano and tenor saxophone, clarinet), Kirk Knuffke (cornet) and Chris Lightcap (bass) plus John Medeski (piano). Whenever and wherever Mr Wilson and his compatriots play becomes a "revival meeting" masquerading as a concert. There is usually an infectious feeling when this band plays so that, even if the material is "in" or "out", soft or very loud, the listener is an active participant in the proceedings. The drummer contributes 6 originals to the 13-track program. They range from the frisky rhythms of "Some Assembly Required" to the lovely, classically influenced, "Hope (For the Cause)." The highly rhythmical "Dreamscape" resembles an Ornette Coleman melody from the early 1960s and leads right into the hard-driving "How Ya Going?" with a polyphonic melody for piano, soprano sax and cornet. Lightcap's thick tones open "Dancing Waters", a sweet, rubato, ballad with a unison melody for cornet and tenor plus Medeski's impressionistic chordal work. "Gathering Call" was recorded in a 6 &1/2 hour session in late January of 2013 yet never sounds rushed or incomplete. The participants are friends, comfortable with each other, knowing when to push or lay out. This is very much "live" music, alive with possibility, melody and fun, in other words, a reflection of Matt Wilson. He can be serious, he can be meshugenah but he's never phony. 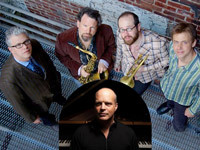 Neither are the members of the Quartet or guest John Medeski - they are musicians and this is good music. For more information, go to www.mattwilsonjazz.com. Alto saxophonist/composer Pete Robbins has worked with bassist Eivind Opsvik and drummer Tyshawn Sorey on numerous occasions while dreaming of playing with pianist Vijay Iyer. "Pyramid" (Hate Laugh Music) is that dream come true, featuring all 3 alongside Robbins on program that combines 5 songs that the saxophonist says "influenced and affected me earlier in my life and musical development" with 4 originals. Sorey, who has worked alongside Iyer in the Fieldwork trio (with saxophonist Steve Lehman), is the driving force on this recording, often "kicking" the music into a higher gear. Whether it's the funky reading of Stevie Wonder's "Too High" or the sweet reworking of Leonard Cohen's "Hallelujah", the drummer makes this music move in good directions. Listen to the "strutting" Sorey does on "Wichita Lineman", pushing the music out onto the dance floor, nudging the soloists away from the melancholy that infused Jimmy Webb's melody. Both Robbins and Iyer's solos pick up on the on that "push" and have an element of strength. The arrangement of "Sweet Child O' Mine" (the Guns N' Roses classic) accentuates the handsome melody (Robbins overdubs clarinet to give his alto an interesting shadow). The piano solo has great power (not unlike Slash's guitar work on the original) and truly fires up Robbins whose solo rips over the intense rhythm section. Nirvana's "Lithium" rises and falls on the interactions of Opsvik and Sorey with short solos that build quickly and burn brightly. The Robbins original compositions are also quite strong, ranging from the slippery rhythms and trance-like melody lines of "Vorp" to the soulful piano chords that serve as the melody of the title track. The leader sits out the song, giving the rhythm section full rein to deliver a powerful performance. The intense drive of the rhythm section on "Intravenous" offers a good contrast to the leader's softer approach on alto - Iyer's 2-fisted solo is fiery and leads to Sorey's solo, which burns with great intensity. Robbins' "Equipoise" lives up to its name with its blend of Opsvik's solid bass lines juxtaposed with Sorey's poly-rhythmic approach and Iyer's stabbing chords. The saxophonist rides the equilibrium with a fine solo then everyone drops out save for Iyer, whose unaccompanied piano brings the piece to a quiet close. The more I listen to "Pyramid", the more its grooves insinuate themselves in my brain (and feet). 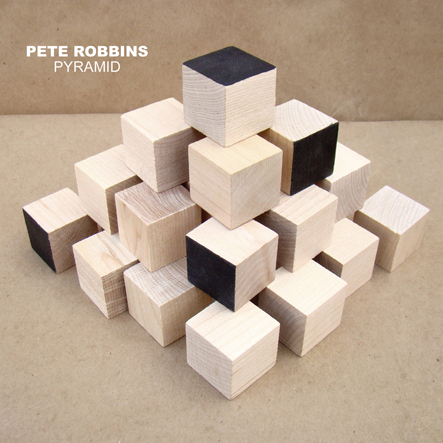 Pete Robbins has found a great balance on this recording, allowing the intensity of the rhythms to co-mingle with his more melodic leanings. With Vijay Iyer, Eivind Opsvik and Tyshawn Sorey, he's found partners who kick this music as hard as they support his vision. Find this CD and let the sounds make you smile. For more information, go to peterobbins.com. Ventured up to Cambridge, Massachusetts, to Scullers Jazz Club to see and hear vocalist/composer Nicky Schrire and pianist Gerald Clayton perform music from "Space and Time". It was the first of 2 gigs billed as "CD Release Performances" (the other occurring on 1/17/14 in The Kitano in New York City). The recording, one of my "Best of 2013", posits Ms. Schrire with 3 pianists - Mr. Clayton, Fabian Almazan and Gil Goldstein - performing standards, "pop" tunes, music from the vocalist's native South Africa and originals. Over the course of 80 minutes, the duo played most of the tracks from the CD as well as newer pieces (one for the very first time). Ms. Schrire is what I would call a "pure" singer, one who tells the "story" in every song without resorting to "flashiness". She does engage in vocal percussion and wordless accompaniment but what she consistently accomplishes is getting to the "heart" of the lyrics in an emotionally satisfying (and, at times, stirring) performance. Mr. Clayton, who turns 30 this year, is a fine musician with a strong left hand and who, in performance, created solo after solo that avoid cliches as well as complimented the emotions of the vocalist. On Charles Trenet's "I Wish You Love", he amplified the sadness and resignation in the lyrics with an impressionistic solo that resonates still, several days after the performance. The unaccompanied vocal opening verse of "Someone To Watch Over Me" was wistful, longing, and showed a vulnerability that drew the listener in. For this evening, the audience became family thanks to Ms. Schrire's honest stage presence, her taking us into her confidence (for example, letting us know about her father's negative opinion of jazz), her humor, her joy at being in Boston, being on stage with Gerald Clayton, being with us. There is no artifice, no distance between the performer and the audience; even when she sang in languages other than English, the music did not lose its emotional power. The joy emanating from the stage was real, taking the chill from the rainy night and replacing the negativity of the long day with a soul satisfying warmth that enveloped the listeners like a hug. To find out more about the performers, go to www.nickyschrire.com and geraldclayton.com. Vocalist/composer Lauren Kinhan is, perhaps, best known for her work with New York Voices and as 1/5th of MOSS (with Lucian Souza, Kate McGarry, Peter Eldridge and Theo Bleckmann). "Circle In A Square" (Dotted i Records) is her 3rd "solo" CD and first to be self-released and is a triumph on numerous levels. 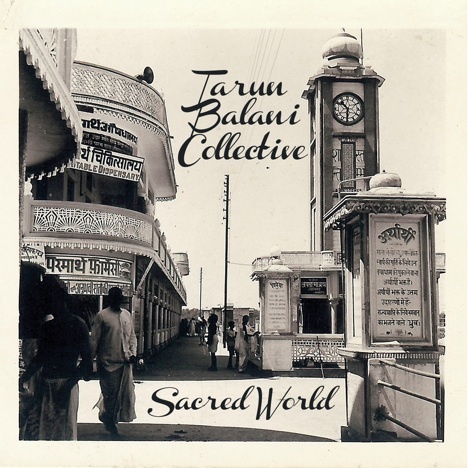 All 12 tracks are original compositions (4 with collaborators) performed by a core group of musicians that includes Andy Ezrin (keyboards), Ben Wittman (drums), David Finck or Will Lee (bass) plus a strong group of guests that includes Randy Brecker (trumpet), Joel Frahm (tenor and soprano saxophones), Romero Lubambo (acoustic guitar), Aaron Heick (alto flute), Chuck Loeb (guitar), Donny McCaslin (tenor saxophone), John Bailey (flugelhorn), Gary Versace (accordion) and a string quartet. However, it's the songs and Ms. Kinhan's powerful and vulnerable vocals that makes this recording so good. These are "adult" songs with lyrics that celebrate jukeboxes (the title track), the frustration of everyday life ("Another Hill to Climb"), relationships that are in free-fall ("We're Not Going Anywhere Today"), fairy tales ("Bear Walk"), the craziness of single life ("Vanity's Paramour") and more. Ms. Kinhan's voice is so wonderfully malleable, blending in beautifully with the instruments (riding atop the beat on "Pocketful of Harlem") or digging deep into her soul to find sadness and truth ("The Deep Within"). As attractive as this music is on initial listening (Elliot Schneiner's production and and engineering makes each instrument stand out without hiding the vocal), it's the strength of the songs and the vocals that makes the deepest impression. Ms. Kinhan's emotional delivery, her ability to bend a note to make a word sustain, and the poetry in much of the program is a joy to return to time and again. And, she can swing! "Bear Walk", a retelling of the Little Red Riding Hood saga, is one of several tunes that may remind the listener of the silky/sly funk of Steely Dan ("Aja" and beyond) but Ms. Kinhan's absolutely rocks the song. Her vocal range, her interaction with guitarist Loeb plus her smart backing vocals kick "Pocketful of Harlem" into the stratosphere. The next time someone tells you that modern music is soulless, does not "speak" to the human condition, refer them to "Circle In A Square." 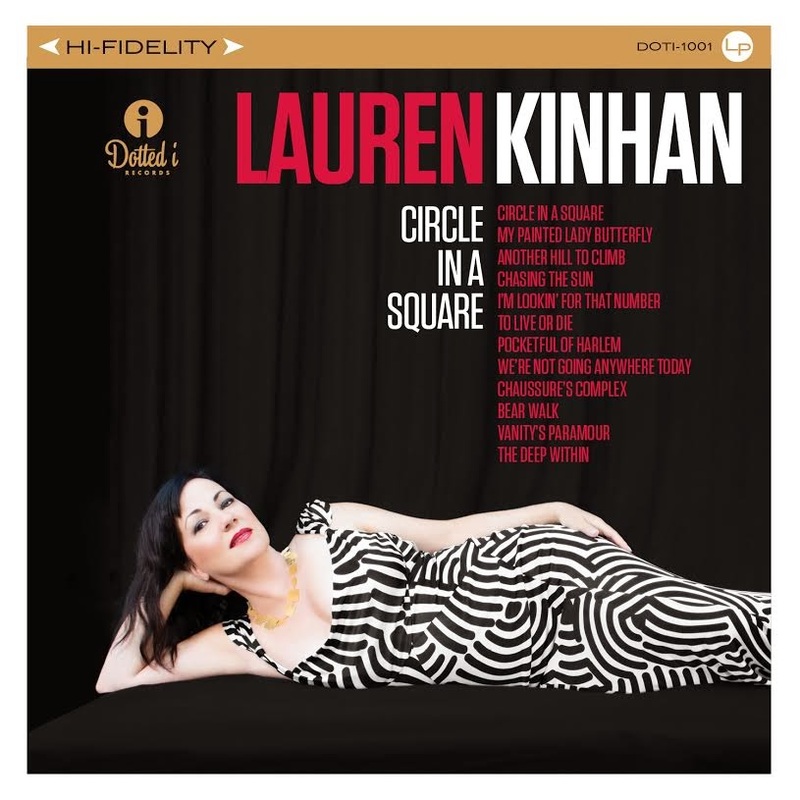 Lauren Kinhan and her ensemble has created music that artfully and splendidly avoids labels such as jazz, pop or funk; this is music that connects on multiple levels with grace, fire and a mature understanding of how one navigates through the shifty terrain of modern life. Dig deeply! For more information and a list of tour dates to celebrate the CD, go to laurenkinhan.com. The New Year has arrived and it's time for new musical experiences. The "Improvisations" series at Real Art Ways, 56 Arbor Street in Hartford continues to impress with the width and breadth of the collaborations that co-curators Stephen Haynes (trumpets, cornet) and Joe Morris (guitar, bass) have brought to the performance space. 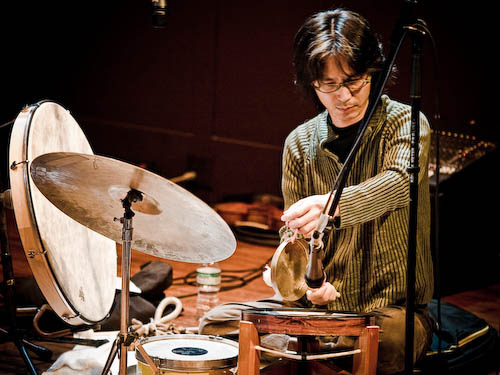 This Sunday (1/12), percussionist Satoshi Takeishi (pictured) brings his unique talents and fascinating array of items to be struck, shaken, caressed and finessed. The Japanese-born Takeishi, whose brother Stomu is a world-class bassist, studied at the Berklee School in Boston and then spent 4 years in Colombia studying and performing Central and Latin American music. 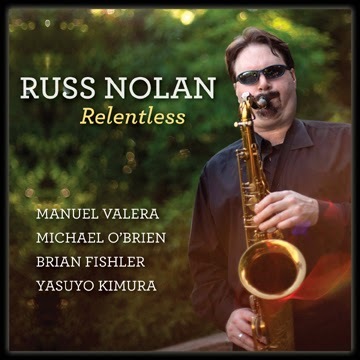 For the past quarter century, he has played and/or recorded with numerous creative musicians including bassist Marc Johnson, percussionist Ray Barretto, Anthony Braxton, cellist Erik Friedlander, guitarist Rez Abbasi and many others. Looks like the weather will cooperate this weekend so you should have no problem making the 3 p.m show. For more information, go to www.realartways.org or www.facebook.com/pages/Improvisations/324014434279441. Any recording by trombonist/composer/educator Steve Davis is a reason to celebrate. A 1989 graduate of the HARTT School's Jackie McLean Institute (at the University of Hartford), Davis has performed with Art Blakey, Chick Corea, Christian McBride and so many others, especially the collective One For All. He's also served on the faculty of his alma mater since 1991 as well as working with Hartford's Artist's Collective. 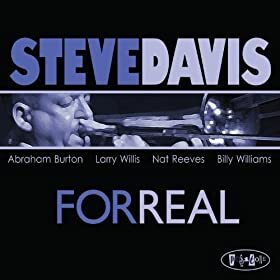 "For Real" is the title of Davis's 4th release for PosiTone Records and an apt description of the man himself. Though he can play with great fire, Davis eschews histrionics in favor of a smooth, steady, tone and music that builds from solid melodic lines and a strong chordal structure. Joining him for this date is long-time associates Larry Willis (piano) and fellow HARTT faculty member Nat Reeves (bass), McLean Institute graduate Abraham Burton (tenor saxophone) and the fine young drummer Billy Williams. Right off the bat, the title track reminds this listener of the sounds of the Jazz Crusaders with its funky blend of 'bone, tenor sax and piano. Burton is a strong soloist, blending the drive of John Coltrane with the bluesy explorations of players such as Booker Ervin and Hank Mobley. Willis, the 71-year old native of Harlem (New York City), is, at turns, playful, wistful, swinging, and always melodic. On the rousing "Tactics" (all the songs on the CD are Davis originals save one), the pianist's solid chords give Reeves the freedom to fly while Williams supplies the drive. Willis's impressionistic chords open the handsome ballad "I Found You" with its 2-part melody line - his graceful solo unwinds freely over the classy foundations supplied by his partners in the rhythm section. The trombonist's solo blends short phrases with longer, sweetly flowing lines. Brazilian rhythms underpin the sprightly closing track "Daylight", giving the soloists a springboard for imaginative and hard-driving explorations. Burton's joyful romp builds off the energy created by Willis's ebullient solo. The leader picks up on the dancing quality of Reeves' bouncy bass lines and Williams's enthusiastic percussion, delivering a sweet melodic statement. Yes, "For Real" is just that - "real" music that is as exciting as it is entertaining. Steve Davis connects with his audience on a number of levels, his honest approach to his art refreshing and certainly enjoyable. For more information, go to www.stevedavis.info. On Saturday January 11, the Uncertainty Music Series continues at 8 p.m. in Never Ending Books, 810 State Street in New Haven, with solo sets by Landon Knoblock (synths, keyboards) and series curator Carl Testa (electronics). Knoblock, whose latest recording features saxophonist Oscar Noreiga and drummer Jeff Davis (collectively known as CACAW), creates music that takes from all genres to create an aural stew that is often noisy as well as melodic. His solo music is multi-layered, with pieces such as "She Called Them Tributes" that blend the fire of Art Tatum with the electronics of Wendy Carlos. Knoblock has a playful edge (give a listen at www.landonknoblock.com/solo-piano-audio) where anything goes, keeping the listener guessing. Carl Testa, whose impressive 2013 solo CD "IRIS" blended his bass playing with electronics, also has a playful edge and will keep you guessing as well. So many people make such a big deal about the New Year, as if turning the calendar was the first step in making those "monumental" resolutions one tends to break before the month is out. Instead of relegating the previous year to distant history and designating the current year to be "the best ever", why don't we make every day we're on this earth the "best day". By that, pay attention to the examples of human stupidity, carelessness, vitriol, and ignorance in the newspapers or on television or in your Twitter feed and resolve not to be that kind of person. Get out of the house (if you're not snowed in or ill) and attend a live performance, a movie, an art museum (or any museum) and become involved. Change begins at home and, if by home one means inside our selves, then so be it. Looking at the state of the world or the human condition and saying "that's never going to change" is a sure sign that it won't change. Feeding one hungry person does not save the entire city but it does help that one person. If our kind gesture helps that one person back onto his or her feet and that person decides to "pay it forward" however he or she can, that's good. If that person does not not do anything, so be it. That does not mean you should not try again. Happy Every Day! Not poetic or even awe-inspiring but I try to make it work for me. Be well!